Inguinal hernia surgery is one of the most common general surgery procedures performed today. Anywhere from 1 to 10 % of patients undergoing a repair will experience a recurrence depending on the type of method used. 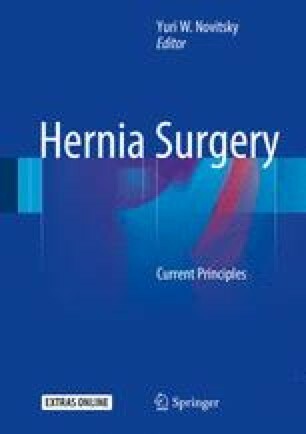 Risk factors associated with recurrent inguinal hernias include age >50, obesity, smoking, family history, and type of hernia. Complications of attempted recurrent repair include post-op pain, inguinodynia, testicular injury potentially requiring orchiectomy, and recurrence. Anatomic planes having been previously violated make recurrent surgery increasingly difficult and risky. Therefore, any decision to reoperate must be accompanied by sound indications for surgery. Previous operative reports need to be obtained and examined to determine which operative approach was used previously, which in turn will direct our current approach. Traditionally, patients having undergone previous open anterior repairs will undergo laparoscopic preperitoneal repairs (TEP or TAPP) to avoid previous operative fields and vice versa. In patients having previously undergone both open and laparoscopic repairs, IPOM is another feasible option. All patients with recurrent inguinal hernias will require mesh repairs unless otherwise contraindicated.